Is the technology in my business appealing to customers and increasing efficiency? Are there areas of my business that hinder efficiency for clients or employees? What technology in my business is out of date, or hasn’t been updated in the last 5-10 years? If you’re answering these questions and finding that there are areas that your business could benefit from updating certain pieces of technology or certain rooms with new technology, connect with us! 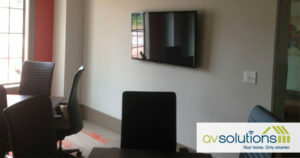 At AV Solutions, we work to deliver high quality products, service and value to our customers. When you schedule an appointment with us, our team of experts will listen to your needs and offer custom solutions that can increase your business’ productivity and functionality. With technology such as overhead paging systems to better reach any employee from anywhere in the office. By installing sound masking or noise cancellation systems to maintain confidentiality in conference rooms while avoiding unnecessary distractions for nearby offices. Through presentation equipment and video conferencing systems to better host meetings of any sort with any employee or client. Contact us for more information, and schedule an appointment!